← Do the Times in Which You Live Shape Your Finances? We recently moved halfway across the country from Illinois to Arizona. This is the first move that hasn’t been a DIY move for us. My husband’s new employer hired a moving company to move us. We packed most of our own things, but we left the valuables for the moving company to pack so that they would be insured in case any of the fragile items broke. When we started unpacking at our new house, I was shocked by how much paper waste there was. I know the moving company needed to pack things carefully to protect themselves from liability, but we were literally awash in a sea of paper and boxes for days. 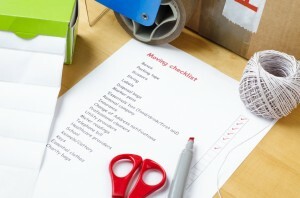 Moving is definitely not eco-friendly, but there are ways to minimize the waste from packing and moving. We couldn’t keep all of the paper that our dishes, pots and pans were wrapped in, but we did keep a very large stash in our office closet. So far we’ve used the paper for the kids’ drawing and painting. We also plan to use some of it at Christmas for wrapping paper. I’ll let the kids’ color or draw on it, and we’ll wrap presents in it. When we ship items, we’ll use this paper as filler for the shipping box. If you have kids, keep the bigger boxes for a variety of activities. We’ve already taped two big boxes together for the kids to use as a tunnel. This kept them occupied for a few hours until the box started falling down. Another idea is to open a box, lay it flat on the floor, and let kids draw roads and a town on the box. If they have small cars, they can spend hours driving the cars through their pretend city. Building a fort out of the boxes is another way to recycle and keep the kids entertained. If you live in a snowy climate and don’t yet have a sled, an opened box can serve as a makeshift sled for a day. Even with all of the ideas above, we still had way too many boxes. Some of the wrapping paper also had a waxy coating, so it wasn’t good for our craft purposes. We hauled all the excess out to recycling on our curbside recycling day. Depending on the condition of your moving supplies, another idea is to sell them. Sure, people can get moving boxes for free by calling their local grocery store, but going back and forth to the store several times in a week to get a few boxes at a time can be a real pain. Many people would rather just buy the boxes, paper, and bubble wrap at a discounted price on Craigslist and get everything they need at once. If you’re moving locally and really don’t want to create or deal with the paper waste that comes with moving, another alternative is green moving. This movement allows consumers to “rent out” reusable moving tubs. People rent them, fill them, and have them delivered to their new home. Once the boxes are delivered, you have a week to unpack before the boxes are picked up. “Prices for short-term bin rental are comparable to purchase prices for cardboard boxes: a large bin of about 4 cubic feet rents for $5 a week from Rentagreenbox and $3 a week from Movers Not Shakers; U-Haul charges $3 for a 4.5-cubic-foot box” (The New York Times). While this is a great solution to box and paper waste, this isn’t yet an option for long-distance moves. Because of the cost involved, this option works best when the turnaround time is quick. Still, there are definite advantages to using reusable moving supplies. “Cardboard boxes, when they are reused, typically last for about four moves”. . .while “plastic bins, not surprisingly, last much longer.” Some of them “have been used 400 times” (The New York Times). How do you handle moves and all of the resulting waste? Would you consider a “green” move next time? When we moved, we tried to pad our dishes and other fragile items with things we were already bringing with us: sheets, towels, even our clothes! After we moved, we flattened some of the large boxes and used them to cover up grass that we wanted to get rid of and then piled it with dirt. The extra newspaper and brown paper from packing we are still shredding up to feed to our worms (we do vermiculture).